The media seems to be awash at the moment with tales of the significant changes or innovations which have shaped great periods of our life – How life evolved from dinosaurs because of flood/ ice/ drought; how wars have changed as weaponry has developed; How transport has changed with the wheel/ the internal combustion engine/the jet engine. So why not Scottish Dance Bands? Jimmy Helm's recent book " Who's on the dance music tonight" is an excellent chronicle of the Scottish Dance Band scene of the past and present, but which sounds shaped the way that bands developed? Everyone will have their own opinion, I have no doubt, but here is mine. 1. Jimmy Shand. Surely the first instantly recognisable Scottish Dance Band sound. - The rock-solid sound of 6 piece band with the unmistakable "Shand Dunt" giving a real emphasis to the dancing beat. Rock steady tempi for country dancing, and yet some of the older 78's are "nippin' on" a bit for the listeners benefit. Shand possibly had the advantage of being around at the inception of television, developing the music within a scene which made it more accessible to many more people, and thus became known throughout the world. This, then, I believe is the benchmark by which all subsequent dance bands based their sound - a gauge of this being that anyone with any interest in our music today, some fifty years on, will instantly recognise the sound of Jimmy Shand! 2. My second benchmark is the Ian Powrie Band. Ian brought a dynamic fiddle-led sound to the band scene. This, together with Pam Brough's expressive style of piano playing (more of an accompanist's style), was a great change from the "Shand Dunt"; not forgetting Mickie Ainsworth's style of playing the second accordion which is still the aspiration of many second box players today! So not only was the Powrie sound innovative in itself, but the individual musicians within the band, were to become role models for musicians of that time and beyond. Improvements in recording techniques may have had a contribution to the Powrie sound as this gave more scope the individual talent, but the individuals involved moulded tremendously well to produce the tight, band sound that was unmistakably “Powrie”. Here, again, television played an important role in promoting the band far and wide, being regulars on the “White Heather Club” and the “Kilt is my Delight”. 3. My third era of the modern Scottish dance band is with Jim Johnstone's band of the early 1970s. This really stems from one album - " A Measure of Scotch" in 1971. This is surely the benchmark in Scottish dance band recordings and the set of reels with Mrs McLeod, De'il Stick da Minister, The Bonnie Isle of Whalsay, and Jim Moore’s Fancy is still the most requested track on any of the BBC's Scottish dance music programmes. Not only that, but Jim’s arrangement of "Niel Gow's Farewell to Whisky" is instantly recognisable as the theme tune to the “Reel Blend”. I believe that this album inspired another generation of bandleaders and even today, any young accordionist with an enthusiasm for dance music regards this album as having the “Wow factor”! Again, the individual musical talents within the the band (John Carmichael on second box, Ron Kerr on fiddle, and particularly Bill Thom on the drums) were brought together to form another definitive style -- dynamic, versatile, innovative, and, for perhaps the first time, lots of new material written by Jim himself. 4. "Innovation" would certainly be the terminology to describe my choice as the fourth benchmark - Iain MacPhail and his Scottish dance band. Ian was almost a "love it or loathe it" sound - the younger generation loving the innovative, free and easy, yet disciplined style (if that makes sense), whilst the older, traditionalists tended to label the band as a "Scottish jazz band". Once again some tremendous individual talent was brought together -- Brian Griffin providing a completely different dimension to the second accordion and Graham Jamieson following very much in the footsteps of Bill Thom creating the sound of a true Scottish Showband. 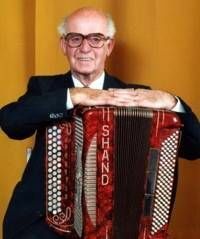 Even today, you can still hear the influence of the wider tuning of Iain's Morino on many accordionists. It was, however, the genius of MacPhail's arrangements which set the band apart from all others - arrangements which were, and still are, truly exciting and innovative - the "De'il's Conundrum" still being very much in demand (Who has the lead part now??). No one else had experimented with chord structures like MacPhail, and if he couldn't find a chord structure to fit the tune, he wrote a tune to fit the chord structure! (Furthermore they were tunes which not only provided a great rhythm for the dancer, but also captured the imagination of the musician). Iain MacPhail was to the Scottish Dance Band scene, what Robert Mathieson was to become to the traditional bagpipes! There are, however, common threads, which unite all of these bands. Each produced a truly innovative sound at the time, to which others latched on, moving our music forward, particularly by the younger, developing, generation of players at the time. In every walk of life, young people have always looked to be different from their elders. Scottish dance music is just the same! The timing of each of my "benchmark" sounds is not, I believe, coincidental either. Each was approximately 10 years after the previous sound, roughly spanning the Fifties, Sixties, Seventies, and Eighties. Perhaps it was because the younger generation of players was looking for something that was different from the norm of the time. This, I think was demonstrated very clearly when "Take the Floor" ran the "Personal Choice" feature. Without knowing the person choosing the tracks, listeners could tell the age of Robbie’s “victim” by the first piece of music chosen - invariably one of the four bands mentioned. All of the bandleaders were approximately the same age at their "benchmark" time - all were experienced bandleaders, admired, and "in touch" with the scene. Each of the four bandleaders has also provided our music scene with many compositions, which have quickly become standards. I don't believe that there has been a "Take the Floor" broadcast at any time in my memory when there hasn’t been a tune from the pen of at least one of these bandleaders played! However, the over-riding factor that every one of these bands has is that they all produced a great, distinctive sound. So where will the next benchmark be? And indeed, will it be from within the true Scottish Dance Band scene? I say this, because the youngest of the interviewees on "Personal Choice" are tending to choose bands like Capercaillie or Wolfstone. Is this where the future of our music lies? Is the folk scene, or the “Ceilidh” scene, the innovation that young people will latch on to today? As fresh approaches are taken and different styles adopted, other benchmarks will surely emerge. Perhaps they are already here! !